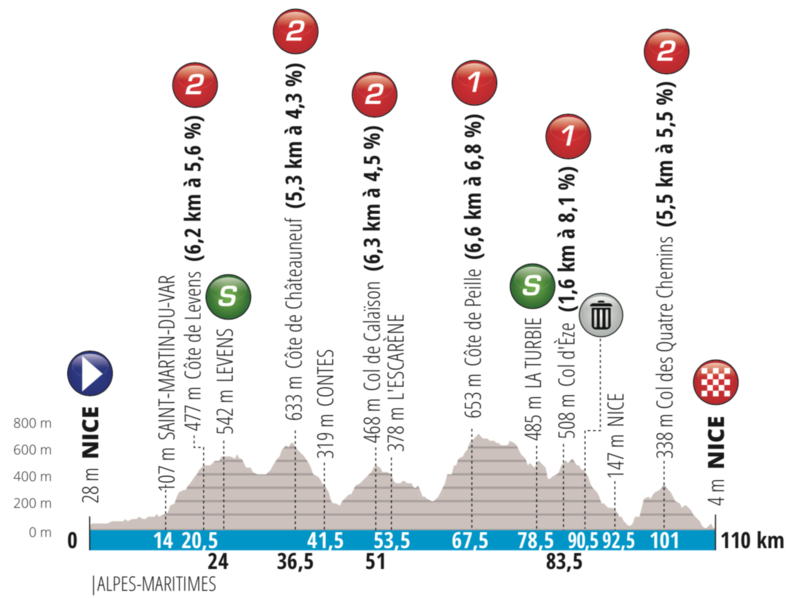 The fast and furious final stage of Paris-Nice, just 110km and if Egan Bernal looks likely to win this afternoon, the other places overall are in play. For three years straight this stage has been one of the highlights of the year but it’s likely to be a more subtle contest for the stage win today. Fiesta Colombiana: Eddy Merckx was on hand for the podium ceremony and the greatest of all time got to meet two future champions in stage winner Daniel Martinez and new race leader Egan Bernal. Martinez won from the breakaway after an intense battle against Miguel Angel Lopez, Simon Yates and Nicolas Edet who proved the best climbers among the giant move of 40 riders that went clear, including Thomas De Gendt who extended his lead in the mountains competition and Philippe Gilbert, the best-placed overall and for a long time virtual race leader. It was only late on the Col de Turini that Sky had to accelerate but this appeared to cost Michał Kwiatkowski who was dropped but it was that or see Gilbert lead. Jack Haig was the last non-Colombian to cope with Sosa’s pace setting and the Queenslander is now fifth overall. Martinez’s win comes a year after he was punched in the face by an angry motorist in Italy, an incident that caused him to black out and forget part of his season last year. Now he’s got plenty to remember and Egan Bernal is on the brink of matching compatriot Carlos Betancur’s 2014 triumph. The Route: 110km over familiar roads. The once-traditional Col d’Eze time trial conclusion to Paris-Nice has been replaced by a dash into the hills behind Nice. They leave Nice for a long neutral procession up the Var valley, a handy warm-up and then there’s hardly bit of flat road all stage. It’s all on the typical snaking roads of the region which constantly twist and turn their way up valleys and gorges. With 55km to go the race climbs out of the Paillon valley for the climb to Peille, the Col de St Pancrace to locals and this is the hardest climb of the day. It’s listed as 6.6km at 6.8%, so worthy of a small Alpine pass on these stats alone but it’s the irregularity that makes it hard work with early sections of 9% and even 12% as it winds up a narrow road with so many bends that a rider need only get 50 metres’ lead to be out of sight. It levels out further up and once over the top comes a twisting descent to La Turbie and Eze with the short rise to the Col and then it’s down the Moyenne Corniche to the coast before climbing the Col d’Eze again but not all the way, it’s 5.5km at 5.5% but with a steep start of 7-8% for the first two kilometres. Over the top they repeat the Moyenne Corniche descent. The Finish: a flat finish line and before that the run off the Corniche and the small rise around the 1km to go point. The Contenders: it’s hard to pick a winner, today’s route is selective but not Alpine an the descent and flat finish suit someone with a sprint and some race craft. So Michał Kwiatkowski (Team Sky), L-L Sanchez (Astana) and Dylan Teuns (Bahrain-Merida) are the prototype riders. Team Sky need to crank up the pace on the climb to Peille to eject Philippe Gilbert from the final podium and if a reduced group comes in then Kwiatkowski is handy for the finish while Sanchez and Teuns can take their chances in the final 15km. Paris-Nice isn’t Romain Bardet‘s race but it’s not over yet and the twisty course suit him, he’s sixth overall but will Ag2r La Mondiale want to risk his GC position and the UCI points. Maybe a late move is safer than a long range “Contador style” move especially as the dry roads don’t help a breakaway. Others with space to move are Ion Izagirre to salvage something or add to Astana’s streak depending on which way he sees things; Trek-Segafredo’s lively Giulio Ciccone and Groupama-FDJ pairing Rudy Molard and Valentin Madoaus. Weather: cool and cloudy, early sunshine will lose out to the clouds, a top temperature of 17°C. TV: the finish is forecast for 4.50pm Euro time. It should be available on the same channel you watch the Tour de France and/or Eurosport. If not then cyclingfans and steephill.tv have schedules and streams. Interesting dynamic between Bernal and Quintana yesterday. Obviously competitive but not without mutual respect, did you note each’s flicked elbow as they shared climbing duties near the summit? Alianza Colombiana, at least for a brief instant! Quintana is Bernal’s hero. Meanwhile Quintana recognised that Bernal did most of the leading in that lady searing acceleration. In a way, Quintana is the perfect opponent for Sky, strong but humble. Only competitive when out on a bike. Froome in 2015 said something to the effect that him and Quintana were just blokes enjoying riding a bike and there were some heartwarming footage of the two warming down together (probably after the stage where Quintana chipped some good time away from him). Very true, like most Colombians, they idolise Quintana and Bernal is no different there. There is a great deal of respect for him. But what do you do when you can beat your idol? And in opposite to you “weak Quintana” special experts, Q. just attacked your Sky hero with 50km to go. Slipping into Grand Tour-itis a little early there, aren’t you? A couple of thoughts from yesterday. Last year’s Simon Yates would have ridden away at the end, he seemed to threaten to do so a couple of times but faded in the end. It seems odd that he won the TT but not the big climbing stage. Perhaps this is all part of a strategy to help win the Giro but if so I hope he hasnt sacrificed some of his climbing abilities to garner a few seconds in the TTs. Team Sky seemed to not quite get their tactics right. The early part of the stage was not broadcast so perhaps I missed something but they did seem to let a large break get a long way in front. 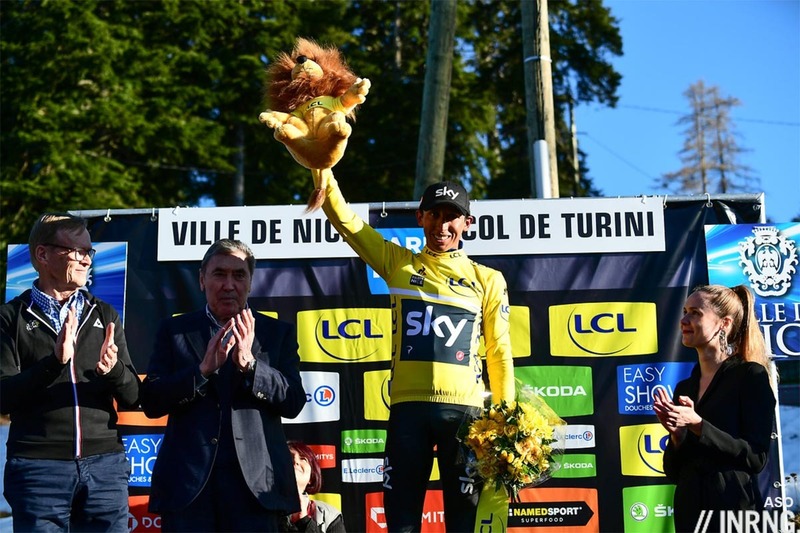 Egan Bernal did comfortably move into the lead in the end but the additional effort cost MK, maybe it would have done anyway but perhaps some more effort before the final climb would have left them in a better place? We all don’t know what the plan was for Yates going into this Paris-Nice. But once he lost some time in the crosswinds he surely had no other intentions than using the race as training while staying safe. The ITT was probably a very welcome test to see whether the specific work he’s done over the winter made him more competitive in this discipline. Then the next day he was intentionally taking it easy again and shipping time. Yesterday the plan probably was to see how the legs respond on the Turini and how strong the competition is. Once he saw that it would take a rather long all-out effort against Lopez and Martinez to win the stage he obviously backed-off and waited for the final to try one final short burst. But by then he had realized that his competitors simply wanted this victory more than him. I agree that they are putting all eggs in one basket, the Giro, for him this year. And you certainly don’t want to be in your very best shape mid-March if the Giro is your no. one goal for the first half of the season. I also found it astonishing how long Sky tried to keep Kwiato in the mix for the GC. Maybe he wasn’t honest about his capability on the day but it certainly caused some suspense that he waited so long before he told Bernal and Sosa to leave him behind. Those two then had to go all-out to save the race for Team Sky. They were clearly suffering, something we rarely if ever saw from Bernal so far. As unrealistic as it might seem for our host I’m rooting for the wolfpack and especially Gilbert to go and try something today on those roads which he knows as well as the backsides of his hands. With a little rain – that somewhat sadly will not fall – he would certainly be at a big advantage with his disc brakes. Would love to see him do a Sean Kelly and win P-N at least once. I think we can look to Mitchelton for an explanation for this. My view is that ever since last year’s Giro they have had a major re-think about training, racing, targets for their team, in short, everything to do with how they deploy Simon Yates. MS want to win the biggest races so its of note that in Spain a few weeks ago and now here Yates lost big time and didn’t even try to win the overall. They have been used as training rides which is rather surprising when Yates is only in his mid-20s and hardly has a raft of wins under his belt in stage races. But if he wins the Giro – something I personally doubt – they will feel their strategy has been vindicated. Im other words, I genuinely think they think the way to race Simon Yates is to train in these races and only to race properly for the overall in grand tours. His utter collapse in Italy last year has completely changed how they approach deploying him. Given he’s second on GC and has had form on terrain like this (Lombardy? ), is Gilbert a contender, especially as he’s not afraid to go from distance? He’s done well in the final stage before but he’d be heavily marked by the others if he tried anything. He must be tired from yesterday too, the last thing he was expecting to do this spring is a 45 minute climb and full effort. Agreed, a long climb is not considered to be the ideal preparation if you target MSR and P-R. But now that he went for it yesterday I’m rather optimistic that he being the thoroughbred racer that he has become even more in recent years will at least try. Some Belgian weather would certainly help and give him a real chance IMHO. But today’s stage won’t even last 3 hours so it will hardly matter for this seasoned battle ship with regards to fatigue looking at next Saturday’s MSR. What a surprise it was to also see Ari Vatanen as a podium ceremony guest. 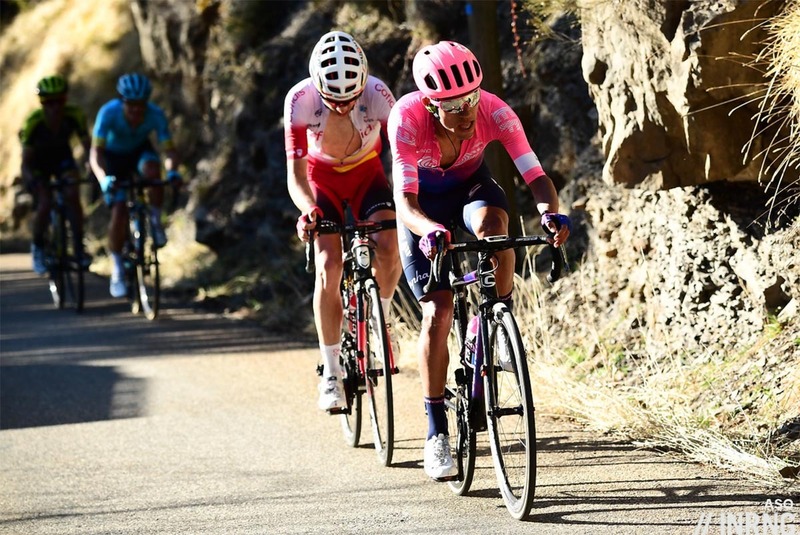 Meanwhile the last two stages in Tirreno Adriatico proved once again that medium mountain stages in rugged terrain provide way more entertainment and time differences among the top riders than a stage with a long drag up a HC climb.